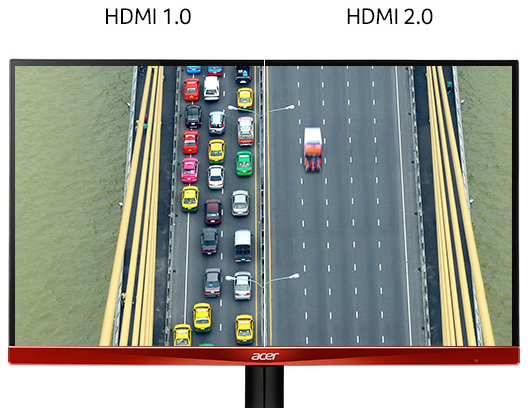 Take your gaming and movies to the next level with the Acer XG270HU monitor. It features 27" large viewing real estate and 2560 x 1440 WQHD resolution that delivers every bit of detail. Everything looks fantastic on the screen thanks to the fast 1ms response time, 144Hz frame rate and ACM 100,000,000:1 contrast ratio. It also supports G-SYNC technology, for tear-free and stutter-free gaming. HDMI, DVI and DisplayPort inputs are built onboard. 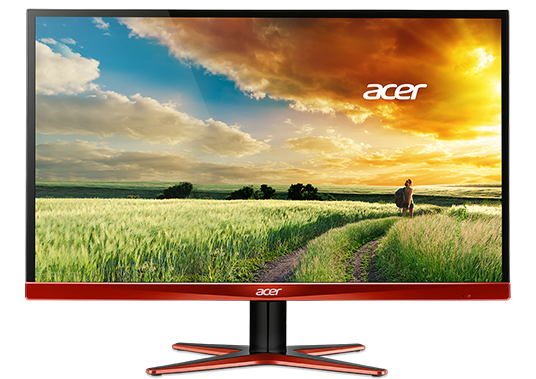 Plus, its frame-less design with arresting red stand are easy on the eye, while the flicker-less, low dimming and Comfy View technology ensure the Acer XG270HU are comfortable to your eyes. The high resolution of this monitor (WQHD, 2560 x 1440 pixels) combines with a rapid refresh rate of 144Hz and a blazingly fast response time of 1ms to deliver ultra-smooth action sequences in great detail. This is also the world’s first frameless gaming monitor, so all that action is free to go where your mind goes. As a high-end gaming monitor, the XG is designed to handle high rates of data transfer. To get all that data to the monitor quickly and smoothly requires high-bandwidth data cables. That’s why these monitors come with high-bandwidth connection ports like HDMI 2.0, DVI (Dual Link), and DisplayPort. 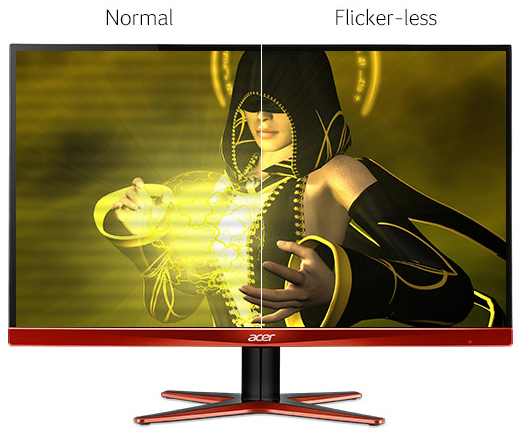 These monitors help to reduce eye strain with Flicker-less, low-dimming (dim to only 10% of brightness in dark environments), anti-glare, and blue-light filtering technologies. Flicker-less technology reduces strain-causing screen flickering, while the blue-light filter lets you filter out harmful blue light. 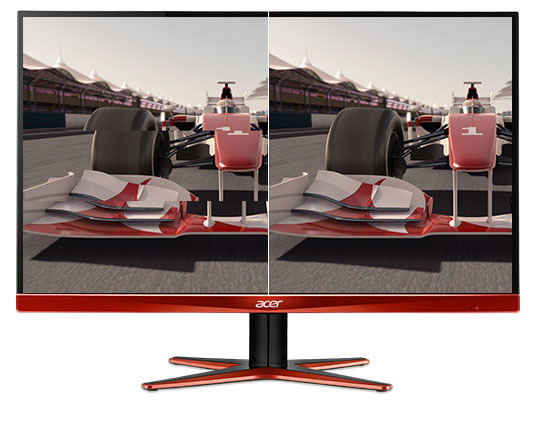 Acer ComfyView technology cuts screen glare to further reduce eye strain. This G-SYNC Compatible monitor gives you more of what you want in a gaming experience. Smooth, tear-free gameplay!! And a whole lot more. Cons: - All of the pictures of this have red accents. Uppon receiving my screen, the accents are brown-ish. Not red. My entire build was specifically color picked ahead of time. Everything is spot on except for this. - Furthermore, the description says G-Sync but it's actually AMD freesync, not GSync. - Idk if its just me, but the colors look way off, even after playing around with it. - Idk why, but I was expecting it to be better resolution. I went from 1080p to 2k and didn't see a difference. But I can see a difference with my retina macbook pro. So there's something off there..
Pros: -THE PRICE! You won't find any other 27'' freesync and GSYNC 144hz, 2k monitor for this incredible price!! Got it on sale at 450$ it's a steal. -Huge screen, thin bezels, stand is fine no problems with it and easy set-up. -Comes with DVI, Displayport and HDMI cables, awesome!! -My gtx 1070 laptop seems to work just fine with Freesync over the included HDMI 2.0 cable. I wanted to buy a display port mini to display port adapter to be able to have GSYNC, but all my games are buttery smooth at 144hz, 1440p with the included HDMI cable and G-SYNC (/freesync?) is enabled in the NVIDIA control panel. Cons: -Built-in speakers are cr*p. Don't use them. -Colors are good, specially after playing with the settings, but nothing extraordinary. Other Thoughts: -This is a HUGE upgrade coming from a 23 inch 1080p 60hz monitor. It's DAY AND NIGHT!! Gaming is so much more immersive, smooth and crisp. The 1070 is perfect for 1440p and freesync/gsync makes sure that there is no tearing, whatever the framerate is (between 30-144fps for freesync on this monitor). Pros: Great price for a 144hz 2k monitor. I couldn't find a better deal, bought on sale for $450. The stand doesn't seem to bother me, it works just fine. Cons: - I have no idea how to calibrate this monitor. 6 axis saturate with color gain and bias has me lost. Have not been able to find much help online. Pretty minor detail considering I found a preset I liked and there is monitor color profiles available to download. - When G-sync is enabled the monitor with randomly go black for about 5 seconds when gaming. I noticed on MSI afterburner a harsh drop in GPU usage while this is happening. Only seems to happen once every half hour or so but worth mentioning, other users seem to have the same issue. Shutting G-sync off cleared this issue for me. Hopefully I can figure out how to resolve this since I bought it for the G-sync. 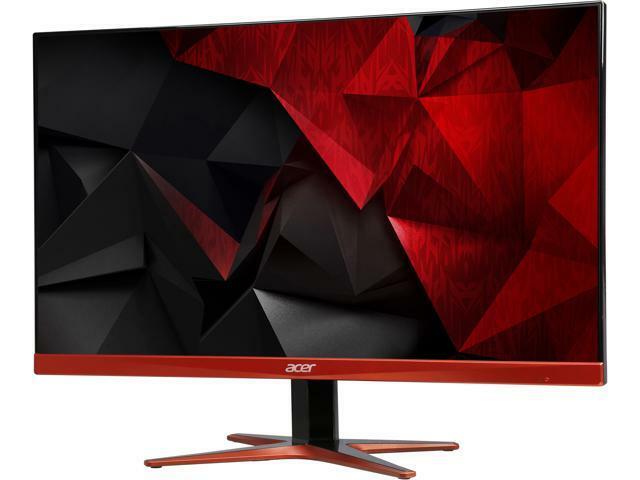 Other Thoughts: Coming from an Acer 1080p 60hz to this 1440p 144hz is mind blowing. My SLI EVGA 1080 FTW2's keeps this beast around 80-100 fps on ultra most of the time. I almost went 4k but wanted the 144hz and wasn't dropping $2000 on the new Predator. I am very happy with my decision since I want high FPS. With 4k I know I would of needed an RTX 2080ti to get the FPS I desire. Other Thoughts: I would recommend this monitor to anyone who want's an excellent gaming monitor for a good price, I did a lot of research before I made my purchase so you can believe me when I say this it's great value and performance is excellent! Pros: Absolutely stunning. This is my first 1440p monitor, as well as my first 144hz monitor. I got it to 144hz, and gsync working without any problems. Color is fine although others have complained about it. Cons: As others have said the stand is a bit flimsy, the screen will wobble a bit here and there. Other Thoughts: Shipping was a bit slow although I can't blame newegg for that, they got it out in good time, it was the courriers problem.